Fish fanatics continue to regard the koi fish as the most attractive classical and ornamental fish in the world. A fortune is spent on the upkeep and hobby of keeping a koi and koi pond. It is a recognized fact that appropriate breeding could produce a wide variety of brightly-colored and unique koi fish, one that can really be easily distinguished from the other. In the process of breeding the fish, koi enthusiasts and breeders come to define certain varieties. Koi breeding and domestication was first initiated by Japanese fish enthusiasts. The Japanese have long experience in breeding koi, this has resulted in a broad range of types and breeds which they named according to color patterns and combinations. Koi fish belong to the same carp category, yet they remain unique in so many ways. Ogon – These koi fish are shiny and metallic. They could either be metallic gold or orange. Ogon in the Japanese language means gold. Their name is thus derived from their distinct color. There are however ogon koi with cream colors but they can hardly be found nowadays. Asagi – The word asagi means pale blue. Their royal pale color juxtaposed with an orange-red belly made the asagi a true sight to behold. They can also be seen with scales forming a net pattern. Kohaku – The Japanese called this fish Kohaku due to its distinct color which is red and white. Kohaku is the Japanese word for red and white. They are also the most common variety of koi. Bekko – This koi fish is recognized by its black markings or spots on the body. These dark spots are similar to a tortoise shell. Tortoise shell in Japanese means bekko; hence, the name bekko. The fish could either be white, red or yellow. Utsuri – The fish belonging to this category is black stained with yellow, red or white. These color patterns resemble ink stains. The fish is called utsuri koi because it is the Japanese word which means “to print”. Matsuba – The Japanese called this fish matsuba because its color patterns look like a pine cone, which in their language means matsuba. Krasugoi – This variety of koi is solid black with an orange belly. In Japan, it means “the crow” which explains why they called the fish krasugoi. Showa – This fish has black as its base color. Its body is black with red and white markings. Butterfly koi – This is the fish that results from breeding with asian carps. Its known feature is that it has long flowing fins. Its color invariably depends on the kind of carp it is bred with, so they can come in different koi colors. Ochiba – This koi variety is adorned by a blue color with yellow markings. Its name means fallen leaves. This list is not complete. The truth is that there is at present an increasing number of koi varieties inhabiting and spreading into backyard and commercial koi ponds throughout the world. Indeed, koi fish have acquired universal acceptance as the symbol of love and peace. To some cultures, the fish could denote anything, yet there is no denying that it’s being considered as popular symbols being seen in various objects, from jewelry to tattoos. JAMES FIELD is a koi fish expert. 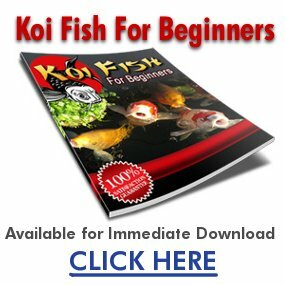 For more information on koi types, visit http://www.koifishadvice.com/.